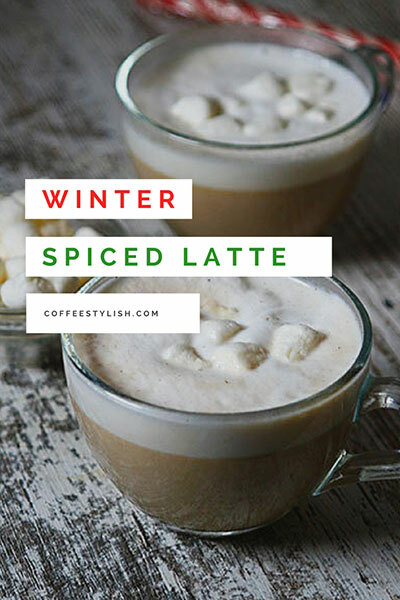 Warm up this season with this easy homemade Winter Spiced Latte recipe. Make a syrup: Bring water, sugar and spices to a boil in a small saucepan. Reduce heat and simmer for 5 minutes. Remove from heat. Make a latte: Pull out one double espresso shot/ brew 1 espresso capsule, add 2 tbsp winter spice syrup, stir, then add 6 ounces steamed milk. If using regular coffee, use 1/2 cup strong black coffee, 2 tbsp syrup and 1/2 cup hot or frothed milk. If you have a Keurig, you can easily make this recipe too. Simply brew your favorite non-flavored k-cup at 4-ounce setting, add syrup, stir and fill the rest of the cup with hot milk. Note: Feel free to tweak the seasonings for the syrup as you’d like. I don’t like using too much allspice, but you can add more if you like. You could also add some nutmeg or ginger. From time to time, I like to add several orange peels to the mixture. You can also make a big batch of winter spice syrup and refrigerate. Syrup can be stored in the fridge in an airtight container for up to 1 month. Let cool completely before refrigerating.